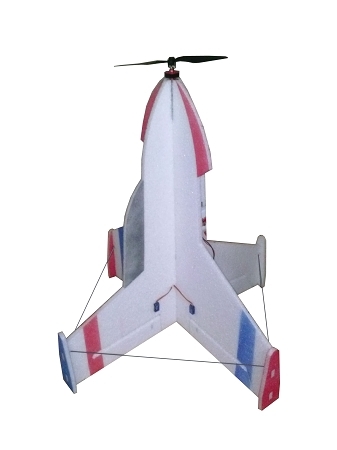 The GNATS VTOL was designed by Leadfeather from RcGroups. It is a tail-sitting VTOL jet; kinda like a Pogo.. Easy to fly and easy to hover. Add the durability of epp and the result is a low anxiety very fun ship to fly. The GNAT was designed to be very easy to build, fly and hover. Minimal parts, easy to paint and decorate. When balanced and trimmed well it will lock into a nice high alpha flight and will also hover hands free. To see the instructions page, click . Kit includes the laser cut foam parts with the bevels finished as well as a hardware pack containing the stiffeners, push rods, control horns and a motor mount. A 5 channel radio with elevon and p-mixes or an elevon mixer and a reversing v-tail mixer is required. More details can be found on the GNATS thread on .